Seems like all most folks want to chat about lately, is El Niño… Is it coming? Is it here? When will it hit my house? (kidding) So, I’ll give you what you want. Here is an updated look at when El Niño may develop, how strong it will be, and the potential result for the fall. The above graph shows all different kinds of computer models looking at the same thing El Niño. The yellow line is the mean model solution and indicates a moderate El Niño by late summer and fall. 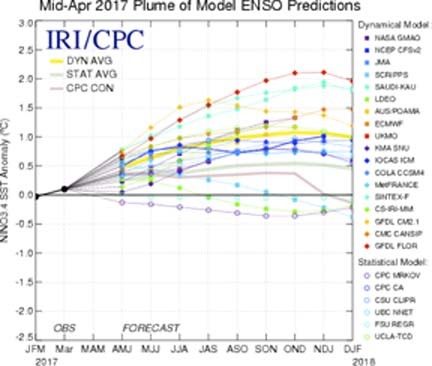 While the strength of the upcoming event is still uncertain, certainty continues to grow that an El Niño is likely to occur. 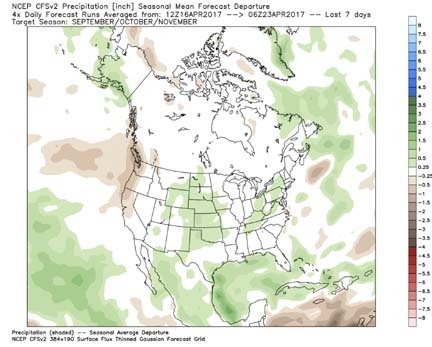 So, what about precipitation during late summer and fall? Check out the maps below. Green means wetter than average, while brown means drier than average. Remember, the NMME Model contains many different models, the CFSv2 Model is one that it includes. 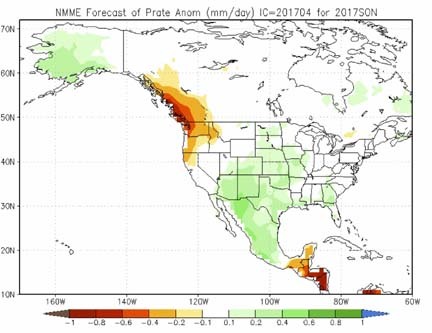 So, it is no big surprise that both the NMME Model and the CFSv2 Model show something similar. What is similar? A wet Great Plains and Gulf Coast, as well as a dry Pacific Northwest. This is a fairly typical weather pattern during an El Niño. I previewed summer for you last month and I know late summer and fall is quite a ways off, but I wanted to give you an early look at what we could potentially see. Stay tuned and I’ll keep you updated.